There are 2 wireless modes in Bluetooth 4.0: Basic Rate（BR/EDR）and Bluetooth Low Energy（BLE）. Different from BR/EDR (traditional Bluetooth) and Bluetooth 3.0, BLE is used to transfer little data rather than audio and massive data. This is because its low power consuming character. In order to keep consuming low power, it simplified hand-in-hand protocol and shortened awaking time. In short time and little data transportation, it only consumes 10% power of traditional Bluetooth. But if in long time and massive data transportation, its low power consuming character won’t show its advantage. 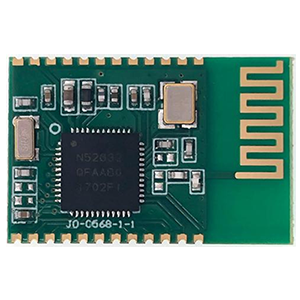 Jinou low energy Bluetooth Mesh module uses Nordic's single-mode BLE solution and supports the Bluetooth 5.0 protocol. Standard UART, the maximum single data volume is 244 bytes.